MDE recommends the use of state level data for grades 4th - 8th grade only with math and ELA. The law suggests 3rd, 9th - 11th grade as well, so many districts are using a building level growth measure to attribute to all teachers in the building. Districts may choose to attribute group attribution (building, grade level, etc.) to all teachers or assign students to teachers of specific grade level/content areas taught. Either way, the law is specific that growth and assessment data shall be 20% of the overall evaluation (20% state, 20% local, 60% observation). Teachers who are exempt from the state level data (early childhood, primary grades, center based programs, educators who teach less than 15 students per year, etc.) For teachers who are exempt, their overall evaluation is 0% state, 40% local, 60% observation). 1. Student Growth Percentiles (SGP) are a normative measure recommended by MDE for ed evals for grades 4-8, math/ELA only. Additional resources available on the SI Timeline. 2. Adequate Growth w/SE is becoming more available through platforms such as Eidex. AG w/SE is a more intuitive measure that identifies the percentage of students who grew enough to maintain proficiency or on track to become proficient. 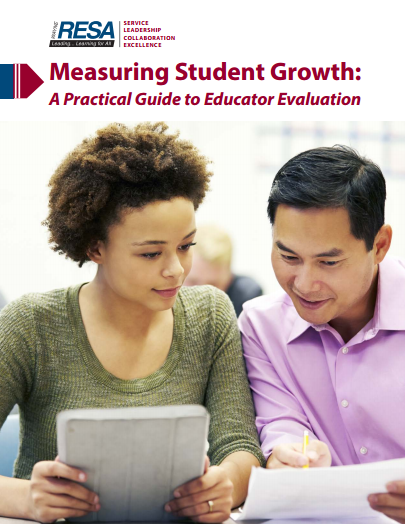 Since this measure combines growth and proficiency, it is less normative and more criterion base. The podcast below explains the WHAT as it is a portion of the longer podcast covering WHAT and WHY found on the AGwSE page. 3. AGPs are used on the Parent Dashboard and School Index by setting a target for student SGP. MDE does NOT RECOMMEND these for ed evals. Resources around AGPs available on the Accountability Page. NOTE: AGPs are not same as AG w/ SE. ​4. Value-Added Models (VAM) are often referred to as the "black box" of student growth based on the complexity of the statistical models used to estimate a students predicted achievement compared to their actual achievement. MDE will be releasing information in the Sept, 2018. Here is a video overview from SAS EVAAS. PA 173 calls for every educator teaching K-12 students to use student growth and assessment data. The majority of teachers may be exempt from individual attribution of state level data. Therefore, 40% of the overall evaluation would be on local data and 60% based on the observation. PA 173 allows local data to come from "student learning objectives (SLOs), achievement of IEP goals, nationally normed (i.e. NWEA, STAR, iReady, etc) or locally developed assessments (interim, exams, portfolio, etc.) that are aligned to state standards." Using local data should use a standard setting process or follow the SLO process. What are some different growth models? Which assessment(s) might we use? (View also Indiana's Assessment Checklist or Rhode Island Toolkit). How might we use formative assessment process to inform educator evaluations? Data should inform decisions, but human judgment will always be an essential component of evaluations. Learn more about student growth by exploring this website, related links, Region 7 presentation or R7 Notes. MDE is also in the process of building resources on their Ed Eval page, some of which are below. What about non-tested grades and content areas? What about the other 20% of student growth for tested grades? According to the American Institute of Research (AIR), 60% of our states across the nation answer this question regarding student growth with non-tested content/grades by using a PROCESS to create Student Learning Objectives (or SLOs). 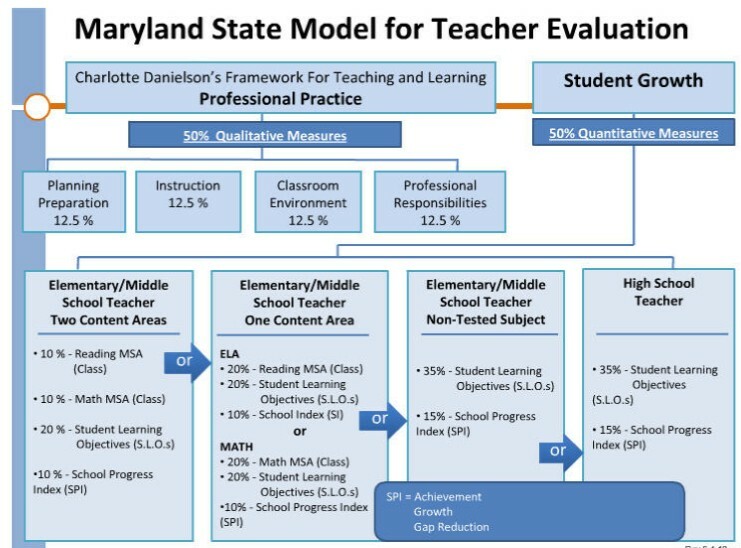 Maryland, as an example, uses state level testing (if applicable), then varies the Student Learning Objective and the Building Index (aka SPI) to varying percents depending on the content and grade level. Rhode Island likely has the best resources to date (2016) on Student Learning Objectives, including guidance, interactive modules, samples and rubrics.